Published online: January 28, 2019. This PDQ cancer information summary for health professionals provides comprehensive, peer-reviewed, evidence-based information about the treatment of childhood central nervous system atypical teratoid and rhabdoid tumor. It is intended as a resource to inform and assist clinicians who care for cancer patients. It does not provide formal guidelines or recommendations for making health care decisions. Primary brain tumors, including atypical teratoid/rhabdoid tumors, are a diverse group of diseases that together constitute the most common solid tumor of childhood. 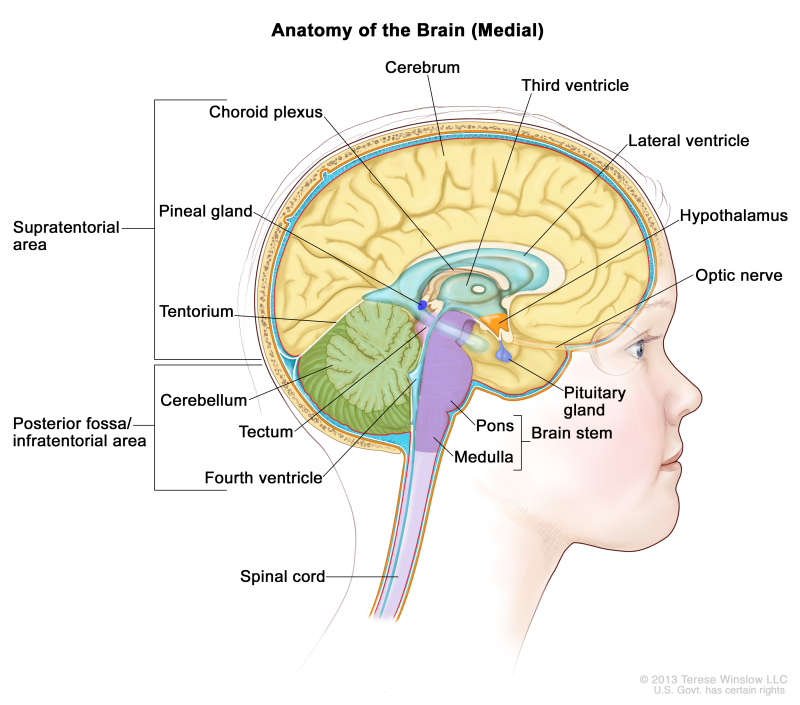 The PDQ childhood brain tumor treatment summaries are primarily organized according to the World Health Organization classification of nervous system tumors. [1,2] Brain tumors are classified according to histology, but immunohistochemical analysis, cytogenetic and molecular genetic findings, and measures of mitotic activity are increasingly used in tumor diagnosis and classification. Tumor location and extent of spread are important factors that affect treatment and prognosis. For a full description of the classification of nervous system tumors and a link to the corresponding treatment summary for each type of brain tumor, refer to the PDQ summary on Childhood Brain and Spinal Cord Tumors Treatment Overview. CNS atypical teratoid/rhabdoid tumor (AT/RT) is a rare, clinically aggressive tumor that most often affects children aged 3 years and younger but can occur in older children and adults. Approximately one-half of AT/RTs arise in the posterior fossa. The diagnostic evaluation includes magnetic resonance imaging (MRI) of the neuraxis and lumbar cerebrospinal fluid examination. AT/RT has been linked to somatic and germline mutations of SMARCB1 and, less commonly, SMARCA4, both of which are tumor suppressor genes. There is no current standard treatment for children with AT/RT. Multimodal treatment consisting of surgery, chemotherapy, and radiation therapy is under evaluation. Based on present biologic understanding, AT/RT is part of a larger family of rhabdoid tumors. In this summary, the term AT/RT refers to CNS tumors only and the term rhabdoid tumor reflects the possibility of both CNS and non-CNS tumors. Unless specifically noted in the text, this summary is referring to CNS AT/RT. The exact incidence of childhood CNS AT/RT is difficult to determine because the tumor has only been recognized since 1996. In two North American prospective studies performed by the Children’s Cancer Group and the Pediatric Oncology Group for children aged 3 years or younger at diagnosis, retrospective review disclosed that approximately 10% of children with brain tumors had AT/RTs. A Taiwanese study found that AT/RTs account for 26% of primitive or embryonal tumors in children younger than 3 years. The Austrian Brain Tumor Registry (recruitment period, 1996–2006) confirmed that AT/RTs represented the sixth most common malignant brain tumor among 311 newly diagnosed children (6.1%), with a peak incidence during the first 2 years of life. The incidence in older patients is unknown. However, in the Central Nervous System Atypical Teratoid/Rhabdoid Tumor Registry (AT/RT Registry), 12 of the 42 patients (29%) were older than 36 months at the time of diagnosis. Approximately one-half of all AT/RTs arise in the posterior fossa, although it can occur anywhere in the CNS. [3,6] Tumors of the posterior fossa may occur in the cerebellopontine angle or more midline. Involvement of individual cranial nerves has been noted. They may also develop ataxia or regression of motor skills. All patients with suspected childhood AT/RT should have MRI of the brain and spine. Unless medically contraindicated, patients should also have lumbar cerebrospinal fluid inspected for evidence of tumor. Patients may also undergo renal ultrasound to detect synchronous tumors. Prognostic factors that affect survival for AT/RTs are not fully delineated. Age younger than 2 years. Most published data on outcomes of patients with AT/RT are from small series and are retrospective in nature. Initial retrospective studies reported an average survival from diagnosis of only about 12 months. [5,6,10,20,21] In a retrospective report, 2-year overall survival was better for patients who underwent a gross-total resection than for those who had a subtotal resection. However, in this study, the effect of radiation therapy on survival was less clear. Children aged 3 years and older with AT/RT who received postoperative craniospinal irradiation and high-dose, alkylator-based chemotherapy had improved survival compared with patients younger than 3 years. In this report, the incidence of leptomeningeal metastases was also higher in the infant group of patients. In one prospective study of 25 children with AT/RT who received intensive multimodal therapy, including radiation and intrathecal chemotherapy, the reported 2-year progression-free survival rate was 53%, and the overall survival rate was 70%. Childhood central nervous system (CNS) atypical teratoid/rhabdoid tumor (AT/RT) was first described as a discrete clinical entity in 1987  on the basis of its distinctive pathologic and genetic characteristics. Before then, it was most often classified as a medulloblastoma, CNS primitive neuroectodermal tumor (CNS PNET), or choroid plexus carcinoma. The World Health Organization (WHO) began classifying AT/RT as an embryonal grade IV neoplasm in 1993. Histologically, AT/RT is morphologically heterogeneous, typically containing sheets of large epithelioid cells with abundant eosinophilic cytoplasm and scattered rhabdoid cells, most often with accompanying components of primitive neuroectodermal cells (small round blue cells), mesenchymal cells, and/or glial cells. Immunohistochemical staining for epithelial markers (cytokeratin or epithelial membrane antigen), glial fibrillary acidic protein, synaptophysin (or neurofilament), and smooth muscle (desmin) may help to identify the heterogeneity of differentiation, but will vary depending on the cellular composition. Rhabdoid cells, while not present in all AT/RTs, will express vimentin, epithelial membrane antigen, and smooth muscle actin. AT/RT is a rapidly growing tumor that can have an MIB-1 labeling index of 50% to 100%. The 2016 WHO classification defines AT/RT by the presence of either SMARCB1 or SMARCA4 alterations. Tumors with histological features of AT/RT that lack these genomic alterations are termed CNS embryonal tumor with rhabdoid features. AT/RT SHH: This subset represented approximately 40% of cases and was characterized by elevated expression of genes in the sonic hedgehog (SHH) pathway (e.g., GLI2 and MYCN). Cases in this subset occurred with similar frequency in the supratentorium and infratentorium. While most presented before age 2 years, approximately one-third of cases presented between ages 2 and 5 years. For patients with AT/RT SHH, the mean OS was 16 months (95% CI, 8–25 months). AT/RT MYC: This subset represented approximately one-fourth of cases and was characterized by elevated expression of MYC. AT/RT MYC cases tended to occur in the supratentorial compartment. While most AT/RT MYC cases occurred by age 5 years, AT/RT MYC represented the most common subset diagnosed at age 6 years and older. Focal deletions of SMARCB1 were the most common mechanism of SMARCB1 loss for this subset. For patients with AT/RT MYC, the mean OS was 13 months (95% CI, 5–22 months). In addition to somatic mutations, germline mutations in SMARCB1 have been reported in a substantial subset of AT/RT patients. [9,19] A study of 65 children with rhabdoid tumors found that 23 (35%) had germline mutations and/or deletions of SMARCB1. Children with germline alterations in SMARCB1 presented at an earlier age than did sporadic cases (median age, approximately 5 months vs. 18 months) and were more likely to present with synchronous, multifocal tumors. One parent was found to be a carrier of the SMARCB1 germline abnormality in 7 of 22 evaluated cases showing germline alterations, with four of the carrier parents being unaffected by SMARCB1-associated cancers. This indicates that AT/RT shows an autosomal dominant inheritance pattern with incomplete penetrance. Gonadal mosaicism has also been observed, as evidenced by families in which multiple siblings are affected by AT/RT and have identical SMARCB1 alterations, but both parents lack a SMARCB1 mutation/deletion. [5,6] Screening for germline SMARCB1 mutations in children diagnosed with AT/RT may provide useful information for counseling families on the genetic implications of their child’s AT/RT diagnosis. RTPS, related primarily to germline SMARCB1 alterations, has been clearly defined. [9,19] RTPS is highly suggested in patients with synchronous occurrence of extracranial malignant rhabdoid tumor (kidney or soft tissue) and AT/RT, bilateral malignant rhabdoid tumors of the kidney, or malignant rhabdoid tumors in two or more siblings. This syndrome is manifested by a marked predisposition to the development of malignant rhabdoid tumors in infancy and early childhood. Up to one-third of AT/RTs are thought to arise in the setting of RTPS, and most of these occur within the first year of life. The most common non-CNS malignancy of RTPS is malignant rhabdoid tumor of the kidney, which is also noted in infancy. Cribriform neuroepithelial tumor is histologically and clinically distinct from AT/RT, but it has genomic and epigenomic characteristics that are very similar to AT/RT TYR. Like AT/RT, cribriform neuroepithelial tumor occurs in young children (median age, 1–2 years) and tumor cells lack SMARCB1 expression. Histologically, cribriform neuroepithelial tumor is characterized by the presence of cribriform strands and ribbons, but there is an absence of rhabdoid tumor cells with abundant eosinophilic cytoplasm. Like AT/RT TYR, tyrosinase expression is commonly observed. The outcome of patients with cribriform neuroepithelial tumor is more favorable than the outcome of patients with AT/RT TYR, with only one death reported among ten children with cribriform neuroepithelial tumor. There is no defined staging system for childhood central nervous system atypical teratoid/rhabdoid tumor. For treatment purposes, patients are classified as having newly diagnosed or recurrent disease with or without neuraxis dissemination. A standard treatment for children with central nervous system (CNS) atypical teratoid/rhabdoid tumor (AT/RT) has not yet been defined. Given the highly aggressive nature of the tumor, most patients have been treated with intensive multimodal therapy. However, the young age of most patients limits the extent of treatment, particularly for radiation therapy. Surgery, chemotherapy, and radiation therapy (multimodal therapy). The extent of the surgical resection may affect survival. Data from the Central Nervous System Atypical Teratoid/Rhabdoid Tumor Registry (AT/RT Registry) suggest that patients who have had a complete resection may have a longer median survival, although complete surgical resection is often difficult because of the invasive nature of the tumor. Chemotherapy has been the main adjuvant therapy for very young children with AT/RT. Cooperative group studies that included children younger than 36 months demonstrated poor survival when treated with standard chemotherapeutic regimens alone. The Children’s Cancer Group reported a 2-year event-free survival (EFS) of 14% for 28 children younger than 36 months treated with multiagent chemotherapy. Radiation therapy appears to have a positive impact on survival for AT/RT patients. Of the 42 patients in the AT/RT Registry, 13 patients (31%) received radiation therapy in addition to chemotherapy as part of their primary therapy. The radiation field was to the primary tumor bed in nine children, and the tumor bed and the craniospinal axis in four children. The median survival of these patients was 48 months, while the median survival of all patients on the registry was 16.75 months. In a retrospective series of 31 patients with AT/RT from St. Jude Children's Research Hospital, the 2-year EFS for patients older than 3 years was 78%, which was considerably better than the EFS (11%) for patients younger than 3 years. All but one of the surviving patients (seven of eight) in the older group received craniospinal irradiation and intensive chemotherapy with hematopoietic stem cell transplant; only 3 of the 22 younger patients received any form of radiation therapy, two of whom are disease free. In a Surveillance, Epidemiology, and End Results registry review, radiation therapy was associated with improved survival in children younger than 3 years. The Third Intergroup Rhabdomyosarcoma Study (IRS-III) utilized radiation therapy, intrathecal methotrexate, cytarabine, hydrocortisone, and systemic multiagent chemotherapy. The results of small retrospective series were encouraging,[11,12] leading to the first prospective study of multimodality treatment in this group of patients. On the basis of the previous pilot series, a prospective multi-institutional trial was conducted for children with newly diagnosed CNS AT/RT. Treatment was divided into five phases: preirradiation, chemoradiation, consolidation, maintenance, and continuation therapy. Intrathecal chemotherapy was administered, alternating intralumbar and intraventricular routes. Radiation therapy was either focal (54 Gy) or craniospinal (36 Gy, plus primary boost), depending on the child's age and extent of disease at diagnosis. Results of the prospective study demonstrated a 2-year progression-free survival rate of 53% (± 13%) and an OS rate of 70% (± 10%), with results most favorable in children who were older, had a gross-total resection, and had no metastatic disease at presentation. Six of the eight children without progressive disease at the time of the report had received conformal radiation therapy and two children had received craniospinal radiation therapy; seven children had a gross-total resection and only one child had metastatic disease (this child had persistent, stable disease 1.5 years from diagnosis). A report using the National Cancer Database described the outcome of 361 children with CNS AT/RT who were aged 0 to 18 years at diagnosis and treated in two periods (2004–2008 and 2009–2012). The report confirmed the increased use of trimodal therapy during the study period and an improvement in outcome. Because AT/RT is responsive to radiation therapy, this modality is incorporated into many treatment protocols. Prospective cooperative group clinical trials for AT/RT are greatly needed to better understand how age and extent of therapy affect survival. There is no standard treatment for children with recurrent atypical teratoid/rhabdoid tumor (AT/RT). Trials of molecularly targeted therapy are ongoing. In a study of the EZH2 inhibitor tazemetostat in adult patients with epithelioid sarcoma and non-CNS malignant rhabdoid tumors with SMARCB1 or SMARCA4 loss, prolonged stable disease and objective responses were observed. The activity of tazemetostat in children with AT/RT is under clinical evaluation. NCT02114229 (Phase 2 Study of Alisertib Therapy for Rhabdoid Tumors [SJATRT]): This phase II trial is studying how well an aurora kinase inhibitor (alisertib), administered alone or in combination with chemotherapy and radiation therapy, works in treating younger patients with CNS AT/RTs that are newly diagnosed, progressing, or recurrent. The APEC1621C (NCT03213665) treatment arm of this trial utilizes tazemetostat, an EZH2 inhibitor, which may be of particular interest for children with recurrent AT/RT. NCT02601937 (A Phase 1 Study of the EZH2 Inhibitor Tazemetostat in Pediatric Subjects With Relapsed or Refractory INI1-Negative Tumors or Synovial Sarcoma): Patients with INI1-negative tumors are eligible for targeted treatment with an EZH2 inhibitor. This is a phase I, open-label, dose-escalation, and dose-expansion study with a twice-daily oral dose of tazemetostat. Added text about the loss of SMARCB1 or SMARCA4 protein expression and the results of a study that treated adult patients with an EZH2 inhibitor (cited Wilson et al., Knutson et al., Kurmasheva et al., and Italiano et al. as references 20, 21, 22, and 23, respectively). Added text to state that in a study of the EZH2 inhibitor tazemetostat in adult patients with epithelioid sarcoma and non-CNS malignant rhabdoid tumors with SMARCB1 or SMARCA4 loss, prolonged stable disease and objective responses were observed (cited Italiano et al. as reference 1). Also added text to state that the activity of tazemetostat in children with AT/RT is under clinical evaluation. PDQ Pediatric Treatment Editorial Board. Childhood Central Nervous System Atypical Teratoid/Rhabdoid Tumor Treatment (PDQ®): Health Professional Version. 2019 Jan 28. In: PDQ Cancer Information Summaries [Internet]. Bethesda (MD): National Cancer Institute (US); 2002-.